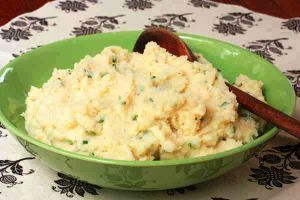 Mashed Potatoes and Celery Root is a Dutch food recipe served with string beans. Put in a pan 2 liters of water and some salt, bring to the boil. Add half of the quantity of string beans to the water and let it cook for 4 minutes. Use a skimmer to take the beans out of the water and let them cool down in cold water. Repeat the procedure with the rest of the beans. Drain the cooled string beans. Peel the potatoes and the celery roots with a vegetable peeler and cut them in pieces. Put the potatoes and the celery roots with two teaspoons of salt in a pan. Fill the pan with water until the potatoes are partially covered with water and bring to a boil. Turn down the heat and let it cook for 15 minutes. Drain and add the milk, butter and nutmeg. Use the potato masher to mash the vegetables. Then stir in the string beans and the vinegar. Season with salt and pepper.